Come join us for Bits & Grits at Mrs. Rowe’s in Staunton! This is a casual event. 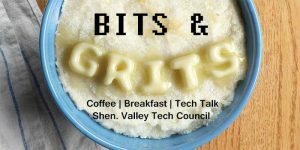 Just show up to drink coffee, have breakfast, or just talk with fellow techies in the Shenandoah Valley. Attendees should look for Kurt Plowman when entering Mrs. Rowe’s.